Paradigm Shift? Plate Tectonics on Mars! Well, every geologist knows that Earth is the only planet in the Solar System with plate tectonics. This means that the crust of the Earth is made of interlocking plates, like a jigsaw puzzle covering the surface of the Earth. Over the millennium these plates slide around and rearrange themselves, also known as continental drift. The margins of the plates are where most of the world’s earthquakes and volcanoes occur. Get that all? There will be a test. Well, until a few days ago it was thought that Earth was the only planet in the Solar System with plate tectonics. There were a few hints Mars might also have crustal plates, but there was also reason to think they didn’t. Olympus Mons, the largest volcano in the Solar System for example. For it to have grown so large implies that it was stationary for its entire life, instead of moving over a hot spot on a crustal plate like the Hawaiian Islands. Without plate tectonics there would be just one Hawaiian Island, as large as all of the Hawaiian Islands combined. There were other hints as well, but hints aren’t proof in the world of science. In the world of conspiracy theories, Bigfoot, and UFOs, yes; in the world of science, no. So have scientists proved Mars has plate tectonics? Well, no. What has happened is that a scientist named An Yin, a planetary geologist at UCLA, has written a paper where he describes the various things he sees in satellite images that are indicative of plate tectonics. And this is a fellow who has spent his scientific career studying plate tectonics on Earth from satellite photographs. He concluded that Mars has a much more “primitive” system of plate tectonics than on Earth, by which he means the plates don’t move nearly as fast as they do on Earth, and there are only two of them, as opposed to Earth’s seven large plates. He thinks the study of plate tectonics on Mars may give insight to how plate tectonics started on Earth, so this is exciting news for planetary geologists and just plain Earth geologists. Aside from nerd appeal, this also means that the chances of life on Mars may now be greater. Mars plate tectonics means volcanism, especially low level volcanism like hot springs, might be more common on Mars, especially in the past. It also means more chemicals and minerals may have been carried from inside Mars to the crust. Both of these make Mars a more hospitable place for life, either for life seeded by meteorites from Earth, or for life to be created in some warm primordial chemical rich ooze. And in a stunning example of serendipity in science, NASA just landed a nuclear powered lab especially designed to look for life. Woohoo! Now its chances of finding same seem even brighter, I’m certainly betting that it will. 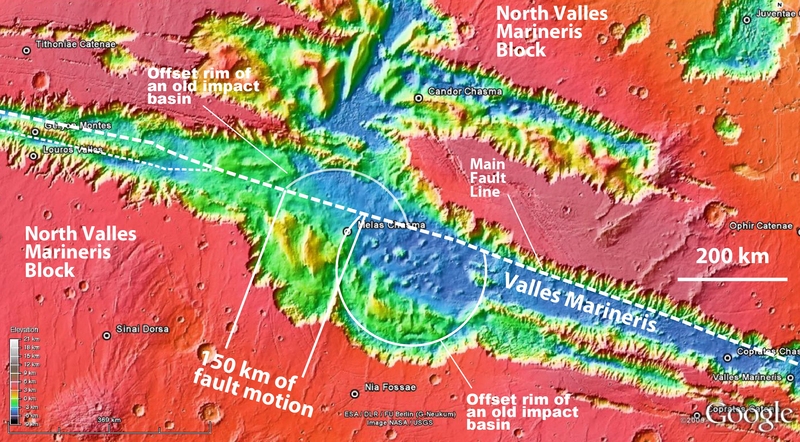 Lastly it means that Mars might have more seismic activity than thought, it was not thought to have any really. Marsquakes in other words. So what now? Now scientists will endeavour to prove or refute the new theory. Just because it “looks like it from orbit” isn’t proof. From orbit Mars looked like it once had flowing water and bodies of water, but science considered the case for water on Mars open until the last two rovers found several lines of unmistakable chemical and geological evidence for same. I suspect it will be the same for plate tectonics on Mars, in fact it’s a good bet now that scientists are thinking about ways to look for proof of Mars plate tectonics with the new Curiosity rover. They will also be scanning satellite images of Mars to see what they think of professor An Yin’s evidence, not to mention looking for geological evidence for past Marsquakes. Lastly, I think it’s safe to say that planetary geologists are now plotting just how they might get a seismograph to Mars. Is there a point to this post, other than the nerd appeal? Just a minor one, this is a wonderful example of how science works. A theory is proposed in a scientific publication, and scientists will now test it vigorously in various ways. By testing it, I mean they will look for other signs that are expected to be seen if Mars does have plate tectonics, as well as looking for signs that it might not. Depending on what they find, the theory will get stronger or be discarded. Stay tuned.